I love making bread, it’s my all-time favorite food, above chocolate even! Seriously bread is my weakness. 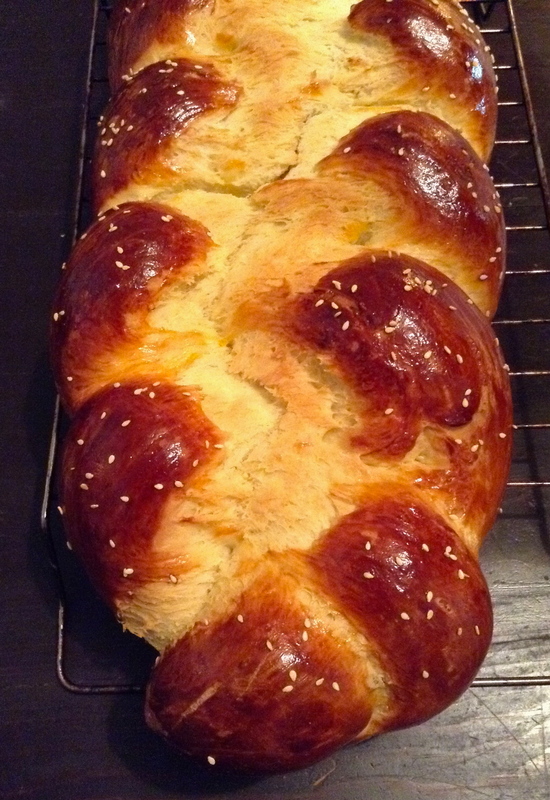 So here’s my latest, pretty versatile recipe that is Challah originally, but you can leave out the eggs, or half the honey and it’s good too. Place the warm water and 1 tsp of the honey into a bowl with the yeast. Let stand for 5-10 minutes, until the yeast is frothy. Then add the rest of the ingredients and mix. Add the flour a cup at a time, just so that you can stop when the dough has come together nicely, you may not need a full 4 cups. Knead the dough for 8 – 10 minutes until it’s nice and smooth and elastic feeling. Then place it in a lightly greased bowl for an hour or so with a clean dry tea towel over top. It should rise and double in size. At this point you can divide the dough into 3 parts and roll out each and braid it, or you can roll it into little balls to make buns. Whichever you decide, place them on a lined baking tray and cover with the same tea-towel for another hour. Once the loaf or buns have grown again, preheat the oven to 180C or 350F and lightly brush the egg you set aside previously, over top of the dough (this is not necessary, the buns in my picture below aren’t egg washed). Bake for 20 – 25 minutes (a whole loaf) or 15 – 20 minutes for buns.